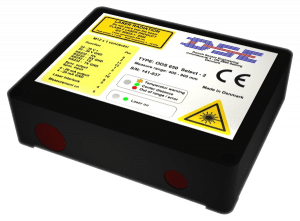 ODS Black-Line Select-2 is a series of sensors offering 10 different measuring ranges, compact housing and attractive pricing. ODS Black-Line Select-2 is a series of sensors offering 10 different measuring ranges, in a compact house and at an attractive price. The Black-Line sensor family is fully integrated, light and robust, and offer all the well-known features of ODS sensors. The measuring principle is optical triangulation, as it is in all our sensors. There are 10 different measuring ranges in this series, operates from 50 mm over 100, 200, 300, 500 up to 750 mm. Measuring ranges start from 180 mm over 200, 400 mm and ends at 230, 280, 380, 480, 500, 600, 700, 900 and 1150 mm respectively. All sensors have a resolution at the beginning of the measuring range of 0.01 mm. At the far end of the measuring range the resolution varies from 0.01 mm to 0.1 mm. Resolution is defined as 2 times the Standard Deviation when measuring static on white paper and outputting at full sampling frequency of 2 kHz without any averaging of the output data. The linearity of the measurement data is defined as the maximum deviation from the true value over the full measuring range. The 10 sensors works within the following limits: ± 0.03 mm, ± 0.06 mm, ± 0.09 mm, ± 0.15 mm and ± 0.30 mm. All sensors are classified as laser class IEC 2 or 3R for some 10 kHz models, which mean that they are not harmful to the human eye. The compact and robust housing of solid aluminum is suitable for most kind of environments, and the applications are innumerable and extend from laboratory usage to steel works and the offshore industry – wherever a non-contact precision measurement is advantageous. Warning signals tells when the environment temperature reaches the limit for trouble free operation, as well as there are indicators for center distance and measurements out of range. All ODS models have a Select functionality, which means that the sensor can be programmed to use various filters and operating modes, and the settings also works in combination. The Median Filter can be set to work with a group seize of either 3, 5, 7 up to 31 measurement values, and still retain the full 2 kHz output frequency. The Simple Average Filter compress a group of output data by calculating an average value. This filter can handle groups between 2 and 200, and can in this way reduce the output frequency from 1000 Hz down to 10 Hz. The user defined Running Average Filter can be set to all even values between 2 and 1000 operating at full measuring frequency. By combining Simple Average Filter with the Running Total Filter it is possible to average over up to 200.000 values. The results of the filter calculations are combined before the output values are converted to the analog signals. Software is delivered with every ODS New Black-Line sensor provides easy setting of the Select parameters. There are 2 simultaneous output signals, a Serial interface and an analog signal. The sensors must be ordered with either a RS232 or a RS422 interface and either a 4-20 mA current or a 1-9 V voltage signal. An Ethernet interface is offered for distance measurement only. The sensor can be programmed to run at 38400 baud, but needs a baud rate of 115200 for outputting at 2 kHz. The analog signal is always updated at 2 kHz except when the Simple average filter is in use. A single sensor is measuring distance to a target, but if two sensors of the same type are interconnected they will automatically function as master and slave sensors. If the two sensors are measuring from each side of on object, the master will output the thickness variation. Correct thickness measurement requires that the sensors are interconnected for synchronized operation. If the object is semitransparent, the sensors can be set to operate on half measuring frequency; they will then measure alternately, and thus not disturb each other. Distance measurement on target with High Temperature.To meet this demands, the ODS New Black-Line family can be modified into High Temperature version to reach different levels of temperature, basically named HT (1.000ºC. 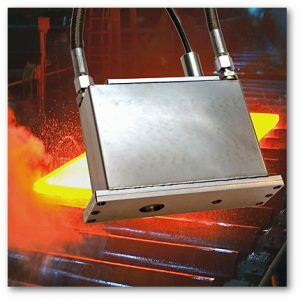 ), VHT (1.300ºC.) and VVHT (1.500ºC.). As a rather unique feature the VVHT version are capable of measuring on extreme hot target surfaces up to 2.200ºC. Water-cooled protection house is available as extra. To further expand the usability of ODS Black-Line sensors for High Temperature applications, we have developed a water-cooled protection house in stainless steel to enclose the sensors. Due to the robust and compact design the cooling-box can easily fit into the most critical mounting positions, even with very limited space. The applications where the ODS Black-Line sensors can be used are innumerable. They extend from laboratories useage to steelworks and offshore industry – wherever a non-contact precision measurement is advantageous. Many of the sensors are being used in very harsh environments. As an example many sensors are being mounted on milling machines of different kinds e.g. milling marble, stone and cast iron or black rubber tyres. Monitoring dimensions of Burger Buns. Measuring thickness of adhesives for plasters. ODS sensors measures the thickness of 25% of the European plywood production. Measuring profile of worn-out tyres during buffing before rethreading.